This pic seems appropriate for this weekend. 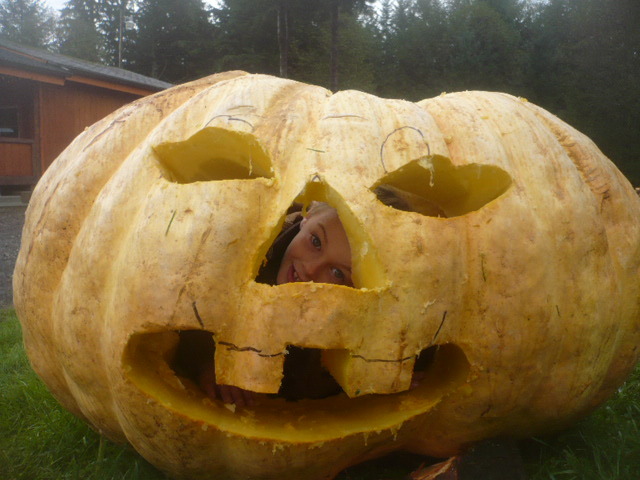 Landon Webster had a big carving job ahead of him; but how many of us had a chance to get INSIDE our pumpkin? Well, hopefully he doesn’t have seeds in his ears now. Real quiet weather this weekend…one weak cold front moves through Saturday night, but now it appears that Sunday is going to be dry. A warm front gives us some light rain at some point Monday, although our RPM model keeps the rain just to the north. The first week of November should be very mild and more dry than wet. Check out that storm! This is the 54 hour sea level pressure forecast from the UW MM5-NAM model. Note the 939 millibar low pressure center off the SW coast of Alaska. There have been several extremely deep lows out in the Pacific already this month…we’ll see what happens in November. Of course if a low that deep were to ever get close to the Pacific Northwest coastline, the Columbus Day Storm would look weak. The center of that storm (and other major storms in history here) was around 955-960 millibars. Note also this storm is about 1600 miles west-northwest of our coastline…to far away to have any effect here. Other than that it looks real quiet the next 5-7 days. As I suggested last night, models are definitely pushing the rain well to the north now early next week. After the inital warm front Sunday night and Monday morning, the main rain band will shift up into Washington and British Columbia. This setup is generally very good for very warm temps in November. Most of the cloud cover and all of the rain stays away, but we get a very warm atmosphere overhead. The frontal band is still close, so we get enough mixing with southerly wind to avoid inversions and fog. I could see temps approaching 70 either Tuesday or Wednesday if everything works out right. For now a high of 65 in the 7 Day forecast seems reasonable. The VERY long range GFS got some excited earlier today. The 12z GFS had shown an arctic blast dropping south over us at Day 16. Well, in the 00z run it’s a warm ridge right overhead instead. That would be why we don’t do 16 day forecasts on the 10 O’Clock News! Not much to talk about this evening…what a quick slow down in the weather action the last 24 hours. We’ve got a system dropping down into California tonight and tomorrow, a mildly interesting cold front Saturday night/Sunday morning, and then maybe some very warm rain Monday and Tuesday. Otherwise Dullsville the next 7 days. 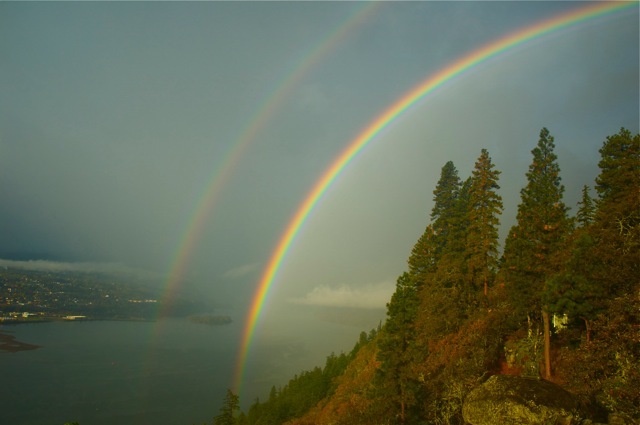 A nice picture above from James Farring in Hood River. He took the picture from the Vista Ridge area up on the north side of Mt. Hood. Not that’s a snow storm! 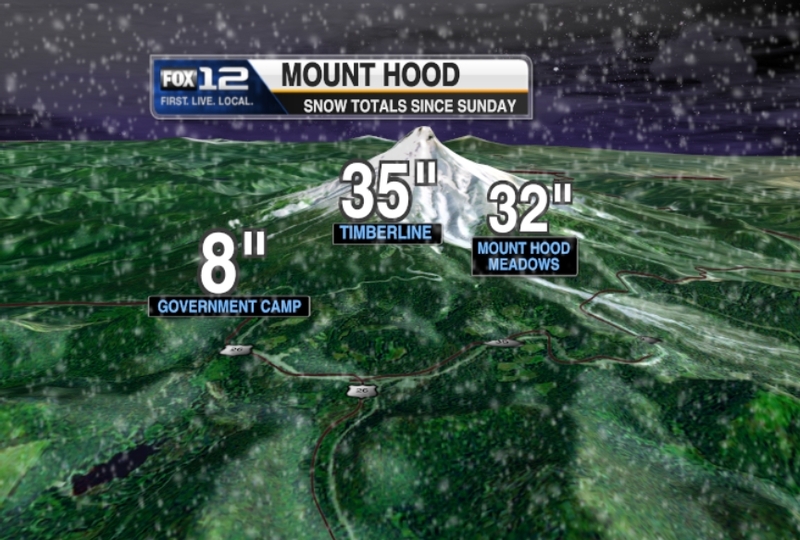 From bare ground to nearly three feet of fresh snow to start the season at Timberline and Mt. Hood Meadows. Even Government Camp had 8″…very impressive for the last week of October. For you skiers and snowboarders, hopefully a sign of the season to come. So will the ski areas open? 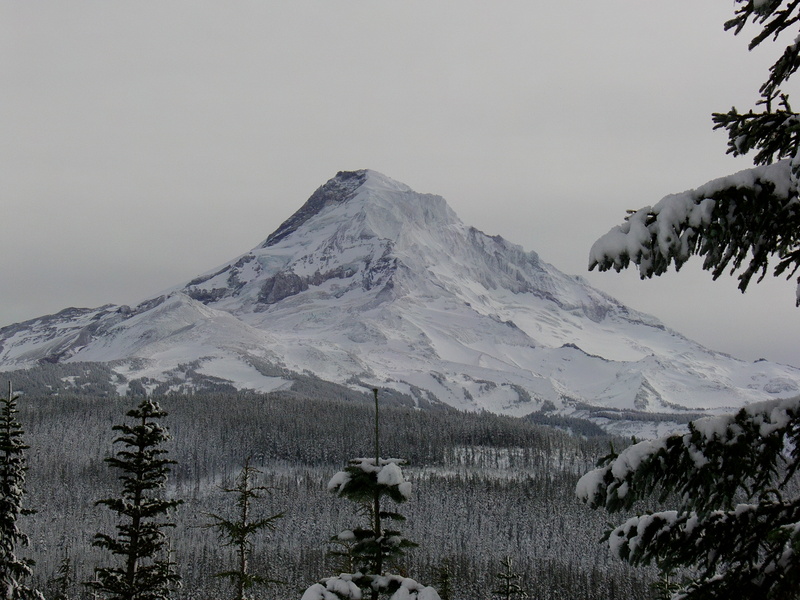 Yes, I know that Timberline is open year round, but that’s only the Palmer Snowfield. I mean the first REAL ski area opening. I’m guessing one of those two areas will attempt to open for this weekend. Just a gut feeling. Now a ski area manager would probably want to know what happens next week? The big issue would be much warmer air that moves in for at least 3 days next week…Monday-Wednesday. The ECMWF and now the GFS are both showing ridging developing over us or just to the east during that period. Freezing levels soar to 9,000′ plus; it means whatever falls will probably be rain at the ski areas. If they get really lucky the main rain band shifts to the north leaving our area mostly dry, but still warm. That seems to be the trend the last 3 model cycles (12z/18z/00z). Many times the last few Falls the models first show heavy rain (a pineapple express) setting up over Northwest Oregon, only to shift the area of flooding rains farther north. That’s occurring now, so we’ll see if the trend continues. As I’ve said before; it’s not necessarily about what one model or model run shows, but what the trend is doing. Other than that the weather should be real dead the next few days. 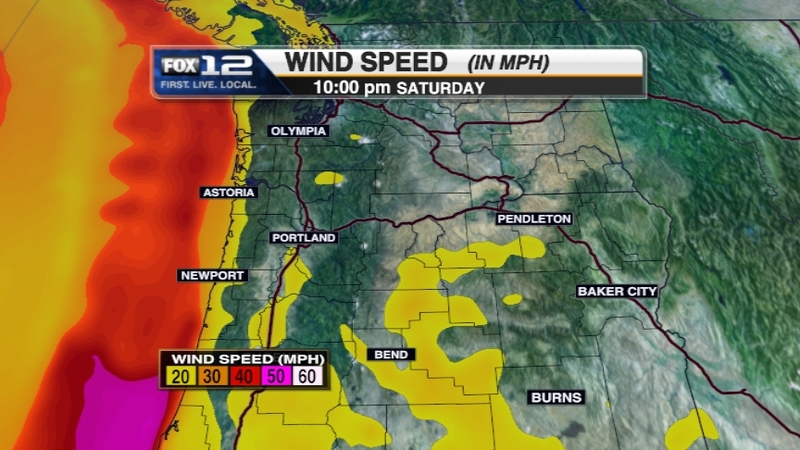 Well, actually the east wind freaks will enjoy a nice burst of Gorge wind later tomorrow and tomorrow night. Probably gusts in the 45 mph range out in the usual windy spots (which would be 60 at Vista House! ), and gusts 30 mph Troutdale/Gresham/Camas. This will be the first cool easterly wind of the season. Every once in awhile we get a real spectacular or different picture…today was one of those. From Sharon McCormack on the bluff up in White Salmon. The view is looking west down the Columbia River. Stephanie and I have a new rule…it’s a busy weather day when you get a viewer picture that has all 4 of the critical elements (motor home, chicken fence, old pickup, latticework on part of house) in just ONE picture. That’s pure gold and it happened today. Now don’t get me wrong…I at one time or another have had 3 of those 4 on MY property, but I’ve never sent in a viewer picture with them. Models had been forecasting 2″ of rain in the lowlands and they did very well. PDX had a record 1.06″ for the day yesterday, and now we have surpassed the average 2.88″ we normally see this month. More showers today with another chance of thunderstorms, just not as wild as yesterday. I see 3-5″ rain/snow has fallen in the west slopes of the Cascades. Rainy season has begun! Whew! More than I expected and slightly lower than I expected yesterday. Snow levels have risen slightly since yesterday evening (they’ll drop again tonight), but it appears at least 15-20″ have already fallen above 5,000′ in the Cascades. As you can see from the picture above, traveling through the passes should be okay during the daylight hours today until colder air moves in this evening. By the way, keep in mind the temperature shown at Government Camp has always been 3-4 degrees too warm too cold. When it shows 30 degrees or lower is generally when you see snow start sticking on the road. It’s been that way for about 3 winters. I wish ODOT would fix it. More snow is on the way the next 24 hours, maybe another 6-8″ above the passes and a good 4-6″ in the passes. If we get another cold system or two early next week maybe a ski area could open the first week of November??? Definitely possible. These were strong as expected with the cold front Saturday night…highest gust I saw was 70 mph at Yaquina Bay Bridge. Most peak gusts were in the 45-60 mph range. I said 55-65 mph gusts, so I think that was reasonably close. Such a strong low sitting over the offshore waters for 48 hours, bringing a long period of gale/storm force westerly wind over the same area, you get a massive swell. I checked all the buoys and 20-30′ is common at all of them right now. I see Buoy #46005 had a 43 ft. wave a few hours ago! That’s a four story building. So the NWS has a High Surf Warning up for the Coast today. Expect 30-35′ swell…we’re starting the season off just like last year when we had the largest swell of the season in early November. Much quieter the rest of the week. Thursday’s system dives down towards California…a non-wind producer and that pattern tends to not give us significant rain. Durign the upcoming weekend we should see the weather action pick up again. I’ve had a pretty good amount of time to look at the models, satellite, radar etc.. this evening since I only have 1/2 hour to do at 8, 10, and 11pm. That’s good because there has been plenty to look at. Here’s what I see that’s different compared to 24 hours ago. 1. Less rain tonight: A weakening front and (slowly) filling low pressure offshore with storm #2 are both approaching. Not a real solid band of rain, but some “shower bands” seem more likely between now and morning. 2. Slightly weaker wind tomorrow from storm #3, the strong one: You can see on our RPM model that there is far less 50+ mph average windspeed approaching the coastline tomorrow evening compared to what it showed last night at this time. Still, average surface windspeeds 40+ and 5000′ wind 70 mph can easily mix down gusts to 60+ mph, so I said 55-65 mph gusts along the coast overnight tomorrow night. Here in the Valleys it’ll probably be windier during the day Sunday as the gradient is tightest south to north at that time. 30-40 mph gusts are likely then. 3. Snow level not quite as low Sunday night through Monday: Looks like it barely touches 4,000′ by Monday morning, so it may be tough to get sticking snow down to Government Camp…better chance for that Monday night and Tuesday. If you really want to see a lot of snow, head higher, Timberline Lodge should get 10-15″ at least during the Sunday night through Tuesday period. 4. A lot of rain here in the Valleys: We get steady rain later tonight (just barely), then a good slug tomorrow night and early Sunday morning with the 2nd cold front. After that it’s a steady barrage of strong westerly flow showers and waves of showers for 48 hours (through Tuesday morning). It all adds up! Maybe 2″ in the driest parts of the Metro area and 3-5″ in the Cascade and Coast Range foothills. Very impressive for late October. Overall still plenty of weather excitement this weekend: a deep sub-960mb low moving relatively close to the Pacific Northwest, soaking rains, and a windy day or two. Not a bad start to our La Nina “Wet Season”! 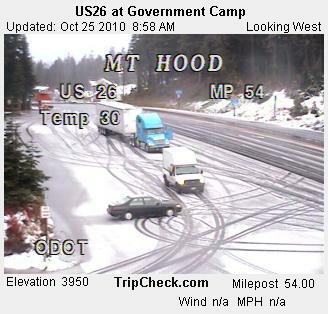 You are currently browsing the FOX 12 Weather Blog blog archives for October, 2010.